Metro Dairy Ltd is a wholly-owned subsidiary of Keventer Agro, the holding company of the Keventer Group. Singapore-based private equity firm Mandala Capital has picked up close to 15% stake in Kolkata-based Keventer Agro for $25 million (around Rs 165170 crore) in an allcash deal. The deal, which pegged Keventer Agro’s enterprise value at $180 million (around Rs 1,100 crore), is one of the biggest PE investments in the dairy space in eastern India. 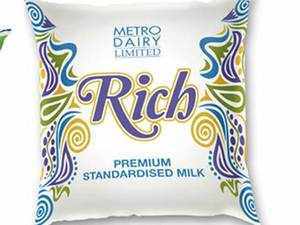 The entire sum will flow into Keventer Agro Ltd’s pouched milk business sold under the brand name Metro Dairy and will be used to fund the the dairy arm’s future growth plans, sources close to the deal said. When contacted, Keventer Agro managing director Mayank Jalan confirmed the development but refused to share details of the deal. Metro Dairy Ltd is a wholly-owned subsidiary of Keventer Agro, the holding company of the Keventer Group. The company is the second largest dairy player in Bengal, next only to industry leader the Gujarat Co-operative Milk Marketing Federation Ltd, which sells its products under the Amul brand. The company also has presence in processed and fresh fruits and vegetables business. For the financial year ended March 31, 2017, Keventer Agro clocked a turnover of Rs 800 crore, while the dairy business, a revenue of Rs 340 crore. Information suggests that the company has suggests that the company has chalked out plans to invest Rs 400 crore in its the dairy busi ness over the next two years beginning fiscal 2017-18. The capital expenditure will be funded by a mix of debt amo unting to Rs 250 crore and equity of Rs 180 crore. The plans include enhancing capacities of existing units, setting up new ones, foraying into new geographies, launching new brands and new variants to communicate better with the new millennials and strengthening its back-end and frontend infrastructure, a top company executive said on conditions of anonymity . The move will help the company become the number 1 dairy player in eastern India, clocking a turnover of Rs 1,000 crore plus business from the dairy business in the next three to five years.